Him and every other lactose-intolerant person out there. 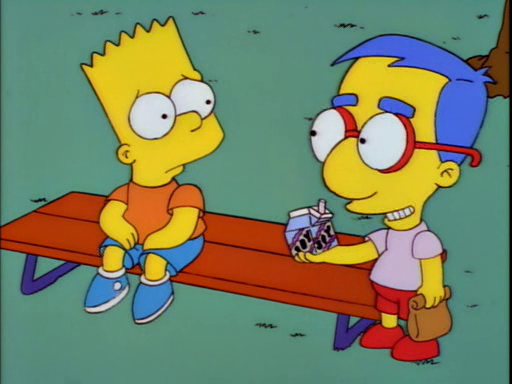 And if Milhouse is allergic to milk, why didn’t he react to the rat milk in “Mayored to the Mob”? Or is it just cow’s milk that kills him? Maybe Rat milk has a lower lactose content? Or maybe there’s something else he’s allergic to, apart from the lactose. I guess he’s lucky the canteen only serves “Malk”. Maybe you just can’t remember every tiny plot element coming from a joke in your storyline? Also, I’m lactose-intolerant, but I drink milk just fine (unless it’s 2 gallons a day, of course). Cheese, however, always ends up sending me to the white friend. My mom and sister have a reverse problem. Cheese is okay, but actual cow’s milk will make them sick (not kill them, like with Milhouse, just make them gassy).